Jared, a Rutgers freshman, attended a spring-break week of learning and from then on, made it known that he was a vegan. Actually, Jared loved meat! He became a vegan to end arguments with his parents about kashrus. Steven, another Rutgers student, was driving from New York to Edison for Shabbos. As the traffic on the New Jersey Turnpike was heavily backed up, he was forced to pull in at the nearby Carteret Yeshivah. The yeshivah was deserted due to bein hazmanim, so Steven spent an uplifting Shabbos “feasting” on stale matzah with two other men who did the same. Aaron, a third student, enjoyed free tuition because he’d made a commitment to the Reserve Officer Training Corps (ROTC). By the time his graduation drew near, he was ready to make another commitment … he wanted to go to yeshivah! Aaron assumed tens of thousands of dollars of college tuition debt and opted out of the army in order to pursue his destiny. American colleges are not known for their attachment to Jewish values. What is going on at Rutgers University that it produces courageous young men like Jared, Steven and Aaron? We asked this question to Rabbi Meir Goldberg who heads a thriving Rutgers kiruv initiative that is changing the lives of hundreds of unaffiliated students each year. 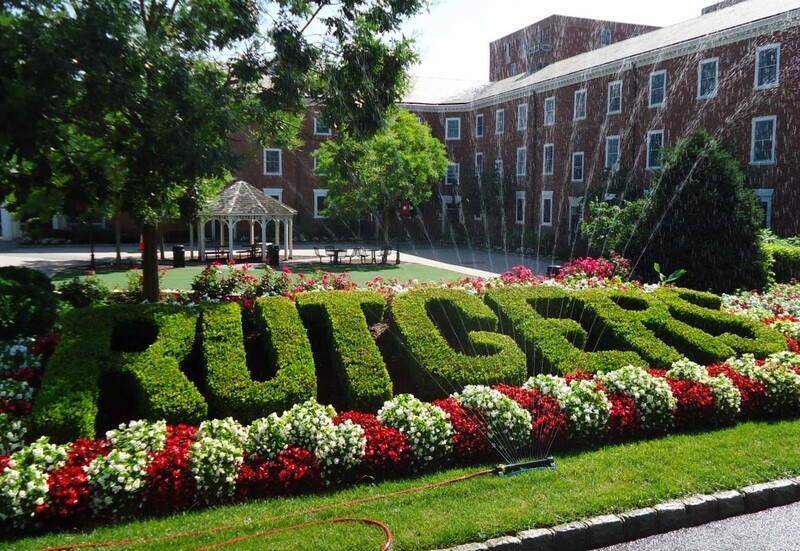 It may be just an hour away from Lakewood, but it’s not likely that many of us know that there are over 6,000 Jewish undergraduates (and 1,200 graduate students) at Rutgers University, New Brunswick; that’s 17% of the undergraduate population and 9% of graduate students. Apart from the approximately 400 Orthodox students among them, most have never heard of Lakewood and few know what it means to be Jewish. Fortunately, both Hillel and Chabad have had a presence in Rutgers for decades, and individual Lakewood yungeleit have traveled to Rutgers to give shiurim. But sheer logistics prevented them from reaching more than a small percentage of these students. The need for more, and still more, campus kiruv could not be denied! The story of Rabbi Goldberg’s arrival at Rutgers in 2004 has its beginnings in the 1970s when a Mirrer Yeshiva yungerman, Rabbi Avrohom Jacobovitz, relocated to the Kollel Institute of Greater Detroit. After several years there, he entered the kiruv field. It was a monumental step. Rabbi Jacobovitz understood that effective campus kiruv had to do more than provide Jewish students with social opportunities and cultural activities. It had to teach them what Judaism is all about so that they could become informed, thinking Jews. Starting with shiurim in the kollel’s basement in the summer of 1980, Rabbi Jacobovitz founded Machon L’Torah. Machon gave students the opportunity to learn more about their heritage. Over the next few years Machon flourished, spreading to every campus in Michigan and reaching many Jews. But it didn’t end there! Rabbi Jacobovitz went on to start Jewish Awareness AMerica (JAAM) to spread his approach to campuses beyond Michigan. There too, JAAM worked to provide a range of educational programs designed to reconnect Jewish college students with their heritage. And the JAAM tasted sweet! Programs started by, or emulating JAAM, were soon flourishing at several colleges, with more to follow. Seeing the value of uniting all frum campus outreach programs as a single front, Rabbi Beryl Gershenfeld, Rosh Yeshivah of two kiruv yeshivos in Eretz Yisrael, established MEOR. Today MEOR can be found at 20 campuses across the U.S.
One of the earliest JAAM initiatives (and now part of MEOR) was the Rutgers Jewish eXperience (RJX). With Rutgers having one of the highest Jewish student populations in the nation, Rabbi Jacobovits recognized the enormous potential for kiruv therein. Providentially he heard about Rabbi Goldberg, a Beth Medrash Govoha yungerman who was (then) giving popular shiurim in Twin Rivers and Margate a few evenings a week, and invited him to run a pilot program at Rutgers. Although he had no previous experience with college students, Rabbi Goldberg was excited by the challenge and willingly accepted, on a part-time basis. As RJX continued to grow, so did its number of employees. Rabbi Goldberg is anxious to give credit to Rabbi Aharon Grossman, his co-director; Rabbi and Mrs. Mitchell and Chedva Jadidi; Rabbi and Mrs. Shlomo and Yehudis Cohen and Mrs. Esther Malka Goldberg for their tireless work. But the stipend is just a bonus. The main incentive of Maimonides is that it is not just “another” set of classes. It’s a program of teaching, discussions and invitations to guest speakers that are specifically designed for the exploring mind, and it’s conducted on a level of depth and sophistication commensurate with their academic skills. When asked what attracts them to Maimonides, the students use words like “intellectual,” “informative,” “inspiring” and “intriguing.” The “old world” burden that their grandparents and great-grandparents discarded is found to be exceedingly relevant, after all. Who would have thought that the answers to their existential questions are actually waiting in their own backyard? The extent of the students’ involvement in RJX varies. Many attend Maimonides 1 and then join advanced classes (Maimonides 2) and other programs on campus and remain a part of RJX for the rest of their stay at Rutgers. A number of these students will also accept a Shabbos invitation in nearby Highland Park/Edison and will attend larger Shabbatons that are held regularly. In this way they gain a hands-on experience of Shabbos, often for the first time. Lakewood is one of the communities where Shabbatons are held several times a year; Shabbos programs for boys and girls are held on different weeks close to Rabbi Goldberg’s home in the Spruce/Pine Street area (with hospitality provided by his neighbors and friends). Coming across a frum town in 21st century America is no doubt a cultural shock for these students. At the same time, the existence of a flourishing community where Jews celebrate their heritage in every aspect of their lives sends a positive, if mind-boggling, message. RJX also participates in MEOR programs that are open to students from all colleges where MEOR has a presence. These include subsidized trips to Eretz Yisrael and Poland; Sinai Retreats (a summer program in the Adirondacks); and internships in Lakewood and Eretz Yisrael. The largest group of attendees at the Lakewood Fellowship (which is run in conjunction with Beth Medrash Govoha) is drawn from Rutgers. For those who have graduated Rutgers and are working in New York, MEOR’s Manhattan program offers young professionals further learning and social opportunities. Mesora in Northern New Jersey runs programs along the same lines. Today, it would seem that a student who chooses to study on an American college campus is far more likely to reject his or her heritage than to reclaim it. And yet, the opposite is happening! Although the majority of Rutgers Jews sadly are not part of the RJX, for the 400 or so who have contact with it each year, RJX is a life-altering experience. There are the “stars” like Aaron who went to yeshivah, recently married in Lakewood and has established a frum home in Edison. And there’s Steven, who made a siyum on Maseches Sukkah at the winter Lakewood Fellowship this year. And there are others like them! About five or six young men and women each year continue on to yeshivos and seminaries where they will typically learn for a year or two before taking their place in the Orthodox world. Feedback from participants shows that 90% of those who attend two semesters at RJX will marry another Jew. (Compared to the devastating intermarriage rates in the U.S. today, this is an outstanding figure.) Moreover, many will bring some degree of Shabbos observance into their homes; some will become fully shomer Shabbos. Rabbi Goldberg stresses that the goals of RJX are realistic and practical; above all else, they seek to maximize the potential of every Jew in accordance with his given strengths and purpose. If this leads to a place of higher learning in Eretz Yisrael, this is an enormous source of nachas. And if it leads to a Jewish marriage for someone who had no plans to stand under a chuppah, this is an enormous source of nachas too. Mesirus nefesh comes in all shapes and sizes!